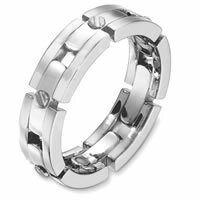 14 Kt White gold wedding band, 8.5 mm wide, comfort fit band. The links are flexible. 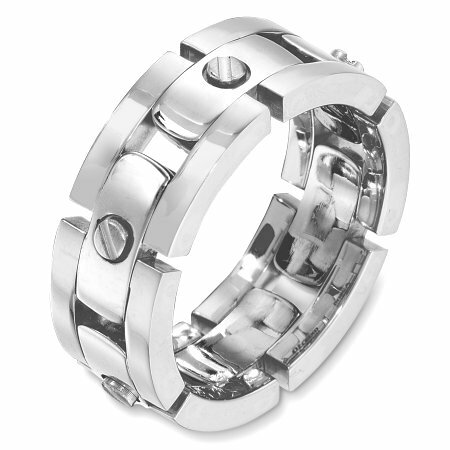 The finish for the center of the ring is brushed and the outer edges are polished. Different finishes may be selected or specified. My husband of 36yrs. lost his wedding band and was devastated. When he finally accepted the fact that he had to replace it he was fearful that he would not find the ring he wanted. 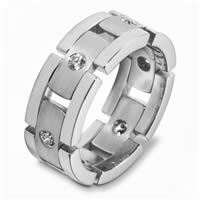 We found it at weddingbands.com and it was delivered quickly beautifully and with wonderful customer service. He felt nothing but joy when he placed the new ring on his finger just before anniversary 37. 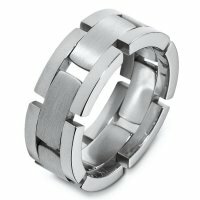 Thank you weddingbands.com. 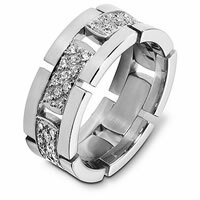 14 K White Gold Wedding Band.